I’m one of those folks whose favorite day of the week is the day I get to mow the grass. Everything from the edging, trimming trees, weed wacking, and, ultimately, creating those perfect lines of freshly cut grass with each pass. I know where all the dips are, best ways around the shrubbery, and exactly where those obstacles are that create that cringe-worthy scraping noise from the spinning blades if I don’t raise the deck first. I know where I can get away with getting as close as possible to the edge of the house and where I really need to use the weed wacker. Then there’s the weed killer sprays for those pesky dandelions. The whole process is therapeutic. You get a chance to simply focus at the job at hand for a few hours and enjoy the time in your own head. Afterward, you take a walk around the house and look at how perfectly you did the job and begin counting down the days until you get to do it again. That said, I may be a rare exception as it may just be another annoying chore for others. Where’s this going? Well, replace that mower with a scrubber (or sweeper) and the lawn for your floors. Same process, same sense of pride when the job’s done. You charge up your machine, fill the solution tanks with magic cleaning chemicals, and hop to it. But just like an overgrown lawn, every dirty floor has its own set of obstacles, each a little different from the next. 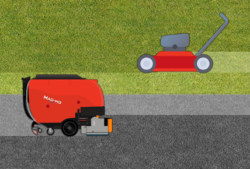 If you have a large, open area to clean, you’re probably going to want a rider scrubber or sweeper with a wide cleaning width, just like a rider lawnmower would be used for similarly open areas when cutting the grass. 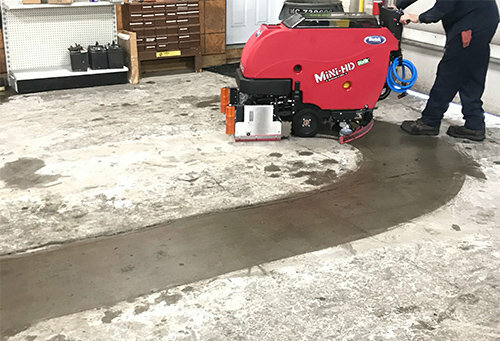 On the other hand, if you have a smaller area to clean, or one with many obstacles and narrow paths, a smaller walk-behind machine may be the better choice. 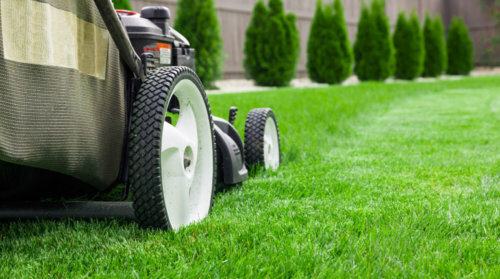 And just as there are weedkiller chemicals and weed wackers for detail work outside, you might need different cleaning chemicals for particular situations in your facility (for example, Royal carpet cleaner or Grand Prix tire burn remover). Do you have a lot of solid debris to clean up as well, or just dust? You might need a sweeper (or sweeper/scrubber) to pick up the larger objects before scrubbing is possible. Cleaning equipment, like tools for other kinds of jobs, aren’t a one-size-fits-all kind of thing. What works for one cleaning job won’t necessarily be the best option for another. In some cases, it might even be best to keep both a small, walk-behind floor scrubber, and a larger, rider scrubber available for different areas within the same facility, just like how one may use both an edger and push mower for different parts of the same property. Using the right tool for the job isn’t a hard concept to grasp, but not everyone has experience with cleaning machines in the same way that they do with mowing the lawn. It’s not uncommon for someone in need of a floor scrubber or sweeper to not be familiar with what options are even available. But who can blame them? My recommendation is to familiarize yourself with the basics of what floor scrubbers and sweepers actually do. Then, contact a cleaning equipment distributor you can trust, describe your cleaning job to them, and see what machines they recommend. Even if you’re a sweeper/scrubber newbie, thinking of your floors like a lawn in need of mowing can simplify a potentially overwhelming job and purchasing decision into something more familiar and manageable. With the right tools, you may even find that cleaning the floor becomes as therapeutic and satisfying as mowing the lawn is for me. You don’t have to figure it all out alone! If you have questions about finding the best cleaning method for your floor, parking lot, hallway, or whatever give us a call or leave a comment below and we’ll do what we can do to help.